As one of our first supported workplaces, our Nursery employs some of the most experienced support teams in our organisation. We pride ourselves on providing a supportive, engaging work environment for employees to thrive in. Here’s more on the business, the team you’ll be working with, and your daily tasks. Our Nursery supplies high quality greenstock and plants all across the state. We specialise in WA natives, in particular plants in the Swan Coastal Plain region. 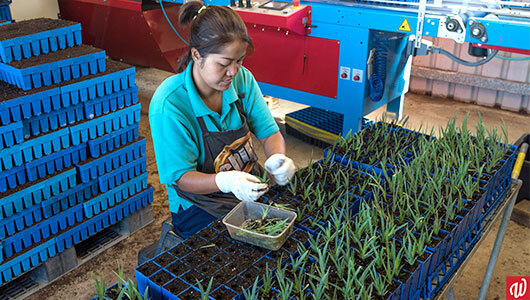 These plants are often used for large commercial works or rehabilitation projects. We grow and supply the plants needed for the project, and work with the Environmental Services team to get them planted. For example, we supplied the WA native plants for Yagan Square in Perth City and the large Northlink WA project. Supervisor Marika leads a passionate team who support and work alongside employees on a daily basis. Everyone is encouraged to try all tasks and work together to complete the job. In addition to this, you will receive training to build your work skills and learn relevant industry experience. You will also be working in the production shed and assist with moving stock into trays. After that the trays are collected and sorted depending on size, and stacked for future use. When you work at the Nursery it’s not just a job – you also become part of the family. We work hard to create a safe and encouraging space for employees to develop and learn, and have fun of course! If you’d like to be a part of the family then contact us today here or on 1800 610 665! Businesses featured in this series do not correlate directly to open positions. For more details please contact us.